We set off, and at first delighted ourselves with the usual graceful motions of the arms. With what grace, with what ease, she moved! ... Never did I dance more lightly. I felt myself more than mortal, holding this loveliest of creatures in my arms, flying with her as rapidly as the wind, till I lost sight of every other object; ... I vowed at that moment, that a maiden whom I loved, or for whom I felt the slightest attachment, never, never should waltz with any one else but with me, if I went to perdition for it! Beheld thee twirling to a Saxon tune! I strolled to one place just on the skirts of the town & found it crowded by those who thus easily obtained the pleasures. It was a large clear piece of ground on the bank of a branch of the Po and resounded from end to end, side to side, with the harmony of a number of musical professors. The little groups into which they had formed themselves were surrounded each one by its circle of ever-moving and never-tired dancers, and spaces between these groups were filled up by a heterogeneous mixture of singers, leapers, boxers, chestnut merchants, apple-stalls, beggars, trees and lookers on. I fell in with one of the most worthy sets ... The nucleus was an enormous stone on which stood totteringly five musicians and twenty one pair were waltzing round them. Here ceased the concert part of the evening, for Miss Woodhouse and Miss Fairfax were the only young lady performers; but soon (within five minutes) the proposal of dancing — originating nobody exactly knew where — was so effectually promoted by Mr. and Mrs. Cole, that every thing was rapidly clearing away, to give proper space. Mrs. Weston, capital in her country-dances, was seated, and beginning an irresistible waltz; and Frank Churchill, coming up with most becoming gallantry to Emma, had secured her hand, and led her up to the top. Revolved the pulsing, stirring waltz. It was ten o'clock at night; the branches of the great trees in the garden of the count's house stood out boldly against the azure canopy of heaven, which was studded with golden stars, but where the last fleeting clouds of a vanishing storm yet lingered. From the apartments on the ground-floor might be heard the sound of music, with the whirl of the waltz and galop, while brilliant streams of light shone through the openings of the Venetian blinds. I was exceedingly delighted with the waltz, and also with the polka. These differ in name, but there the difference ceases — the dances are precisely the same. You have only to spin around with frightful velocity and steer clear of the furniture. This has a charming and bewildering effect. You catch glimpses of a confused and whirling multitude of people, and above them a row of distracted fiddlers extending entirely around the room. The waltz and the polka are very exhilarating — to use a mild term — amazingly exhilarating. [Harriet Vane] got up from the table and made her way into a kind of large lounge, where the middle space was cleared for dancing. A select orchestra occupied a platform at one end, and small tables were arranged all around the sides of the room, where visitors could drink coffee or liqueurs and watch the dancing. While she took her place and gave her order, the floor was occupied b a pair of obviously professional dancers, giving an exhibition waltz. The man was tall and fair, with sleek hair plastered closely to his head, and a queer, unhealthy face with a wide, melancholy mouth. 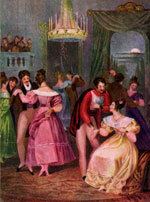 The girl, in an exaggerated gown of petunia satin with an enormous bustle and a train, exhibited a mask of Victorian coyness as she revolved languidly in her partner's arms to the strains of the "Blue Danube". Margarita hung up and at once something wooden in the next room started bumping about and tapping on the door. Margarita flung it open and a broom, bristles upward, danced into the bedroom. Its handle beat a tattoo on the floor, tipped itself up horizontally and pointed towards the window. Margarita whimpered with joy and jumped astride the broomstick. Only then did she remember that in the excitement she had forgotten to get dressed. She galloped over to the bed and picked up the first thing to hand, which was a blue slip. Waving it like a banner she flew out the window. The waltz rose to a crescendo. About the middle of the nineteenth century dancers were already finding the melodies of the elder Strauss too short. They were too short from within, the melodic wave in them receded too quickly. The elder Strauss was no listener. The restless excitability of his life is reflected in the excessive brevity of his invention. He was too active, too overbearing; a waltz must have feminine passages too, must show a love of surrender, a passive desire not to stop. Lanner's waltzes were much more feminine, but they were Ländler. It was Johann the Younger who wrote long waltzes in which the masculine melody of wooing was interwoven with the feminine melody of surrender. It was not only Wagner who believed in the endless melody which fills the world at all times. Strauss too believed quite simply that every waltz creation is merely a question of having made visible parts of the endlessly flowing waltz stream in the ether. So on the night of the party, every bush in the grounds of the Underdunk mansion had one or two animals behind it. It was easy to see what was going on, for it was a warm evening, and the long French windows of the drawing room were wide open. For a time the guests stood about in groups, and Freddy, peeking out through a syringa bush with Jinx and Mrs. Wiggins, saw many old friends — though it was sometimes hard to recognize them with their company manners and their best clothes on. Then an orchestra, which was hidden behind potted palms at one end of the room, struck up a waltz, and soon the cream of Centerboro society were whirling sedately about the room in time to the music. Moments later she was whirling and turning to the stately strains of a waltz played by Silver on the grand piano. The music was rich and civilized, a brocade of sound embroidered upon the wilderness night. Case danced with the casual perfection of a cat stalking prey. "I've been watching you," he said. I started continuous loops on them and went through the rest of the Fred and Ginger list, filling most of the left-hand array with their dancing: turning, tapping, twirling. Fred in tails, sailor's uniform, riding tweeds, Ginger in long, slinky dresses that flared out below the knee in a froth of feathers and fur and glitter. Waltzing, tapping, gliding through the Carioca, the Yam, the Piccolino. And all of them full-length. All of them without cuts. The Balls at Southampton are exceedingly lively, and well-attended. The young Ladies are particularly favourable to a German Dance, called the Volse; for squeezing, hugging, &c, it is excellent in its kind, and more than one Lady has actually fainted in the middle of it. 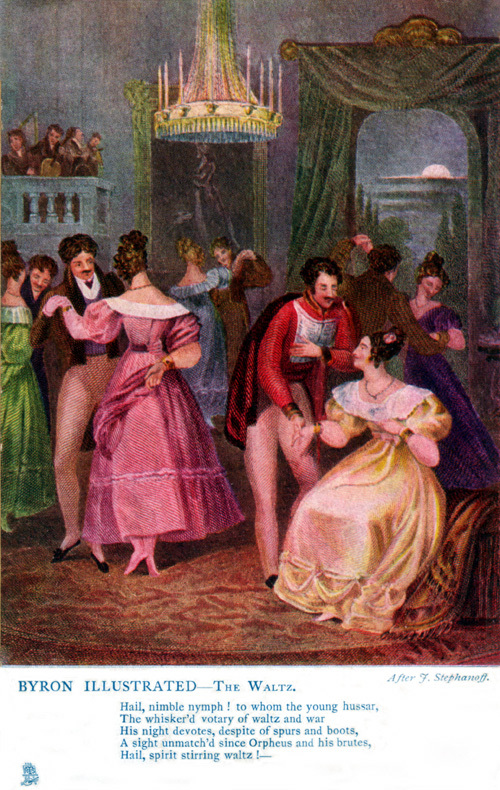 The idea of a couple clasping each other even more closely, with one hand on the other's waist, was held to be positively indecent, and this style of waltzing did not become acceptable until after 1815. & attendees of other dances in San Diego!